Brett Campbell was live today at Milford Lodge! When the children heard that he was here to perform, they went running up to the ballroom to listen to his interactive songs and dances. Once the music started, the children could not keep their bodies still! 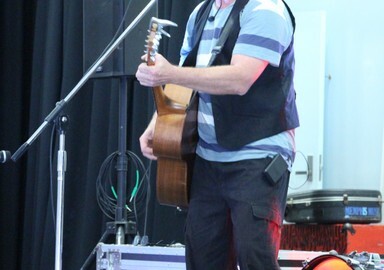 Brett‟s use of guitar, harmonica, drums, cow bells, and vocals kept the children grooving through the morning! To start the show, Brett had the children tell him whether his whistling was good or not so good with a thumbs up or down. The children loved this interactive and hilarious game. Brett would make funny noises, getting all the children laughing and giggling. They were more than ready to move their bodies once the music started. Brett‟s songs and dance moves were inspired by various animals and dinosaurs. One of his first songs was a dinosaur song, so the children had to get up and dance/sing like dinosaurs. First they said, “Roaaaar” like a Tyrannosaurus Rex, then they used their feet to stomp like a Stegosaurus and last they put their arms out to fly like a pterodactyl. 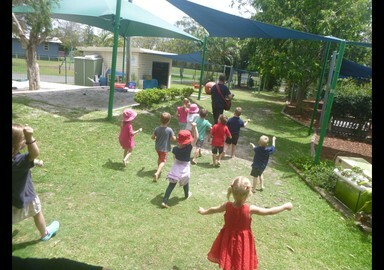 In Brett‟s next song the children danced like elephants, Emus and monkeys! We had some stars of our own today perform for the Milford Village alongside Brett. Brett needed some help from the children to play his instruments, yes! Catherine was on the cow bells, Abbey played the Tom Tom and Elsie was in charge of the drums. Together, they played a song about playing instruments! Brett also gave the children some tips and tricks about how their voices and tongues are very important when singing. Before singing, they warmed their voices up with some fun high and low vocal games. A music bus! Our favourite! The children joined Brett on a boogie around the yard for some more songs. While on our bus ride, we made sure to stop at the „traffic‟ lights and look both ways, including some traffic safety in with our musical adventure! 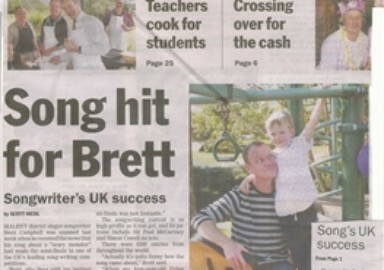 “To end Brett‟s visit, he sang a relaxing song and the children had to lay down. Our bodies needed a little rest after all that movement! Thanks for all the laughs Brett! 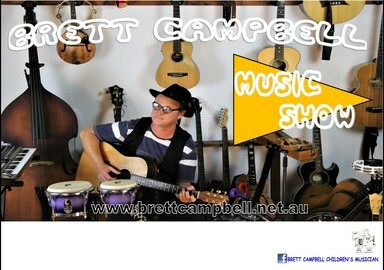 Brett Campbell is a singer-songwriter from Queensland, Australia, and is arguably one of the hardest working musicians around performing over three hundred shows a year. 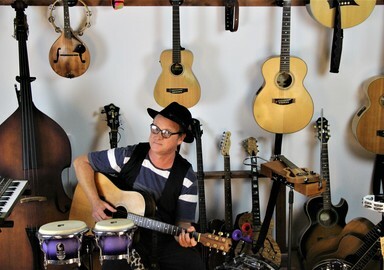 His latest album Let’s Skidaddle is a real winner, featuring eleven original songs that are imaginative, melodic and interactive. I was looking forward to hearing this album because, having seen Brett perform live, I was particularly interested to see if he could capture that raw energy in the studio – I was certainly not disappointed. The opening track “Welcome To The Show” grabs the listener’s attention immediately. 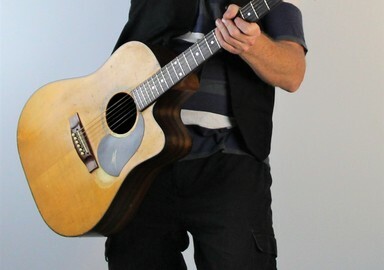 The song features both a lively acoustic guitar and a melodic honky tonk piano. 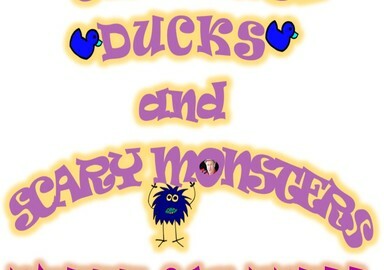 It is a delightful sing along track, providing ample opportunities for the kids to join in on the chorus. “What’s in My Lunch Box?” opens with bongos and continues this positive vibe with the artist describing the variety of goodies contained in his lunch box. “Duck, Duck, Frog”, reminded me a little of the famous ditty “Pop Goes the Weasel” but on this occasion expertly delivered on the banjo. “How many sleeps” is more up-tempo with its use of a shuffle beat and some imaginative bass playing revealing a noticeable skiffle influence. “Cats and Dogs Are My Favourite People” is a very interesting song title and pays homage to “The 59th Street Bridge Song”, adapted slightly to reminisce on the many benefits of pet ownership. Continuing on the subject of interesting song titles, they don’t get much more bizarre than “Triantiwontigongolope”, a melodic tribute to the poetry of C.J. Dennis, with a staccato rhythm and some interesting kazoo playing throughout. 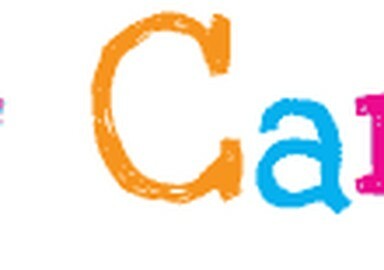 “Can You?” features a clean electric guitar, and some subtle bass playing which leaves the required space for the inclusion of a Hammond organ. This is a superb action song, which I’m sure would be great live or in the classroom. “Crocodile In The Washing Pile” has a great up-tempo drum pattern; with captivating lyrics used to describe the visit you might expect from a number of animals when you live in a zoo. Shades of Bob Dylan are on display here with the harmonica taking centre stage. “Max the Acrobat”, eloquently describes a circus bat, and its variety of tricks. A sparse ukulele introduces the song, along with some solid bass playing and a hypnotic tambourine. “Chloe’s Fright” is both surreal and ambitious, as it explores a child’s night-time fears. The vocals here are really quite haunting as they scrutinise the hidden depths of a child’s imagination, from ‘flying platypuses with horns on their wings’ to ‘monsters with sharp shiny teeth’. Last but certainly not least comes “Dirty Dog Ditty”, which introduces an expertly played didgeridoo courtesy of the very talented Lucas Proudfoot. The song provides a new departure in style, boasting a somewhat funkier feel. It is also great to dance to, with the inclusion of some clever percussion underpinning a hypnotic reciprocal vocal. This song really is Brett Campbell at his best, in both musical style and delivery. 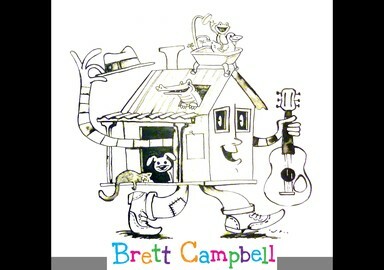 Brett Campbell is an artist who writes songs about the every day experiences of children, and he does so in a simplistic, measured and imaginative way. This album may not contain the most lavish of productions, but it more than makes up for it with the strength of the content on display. 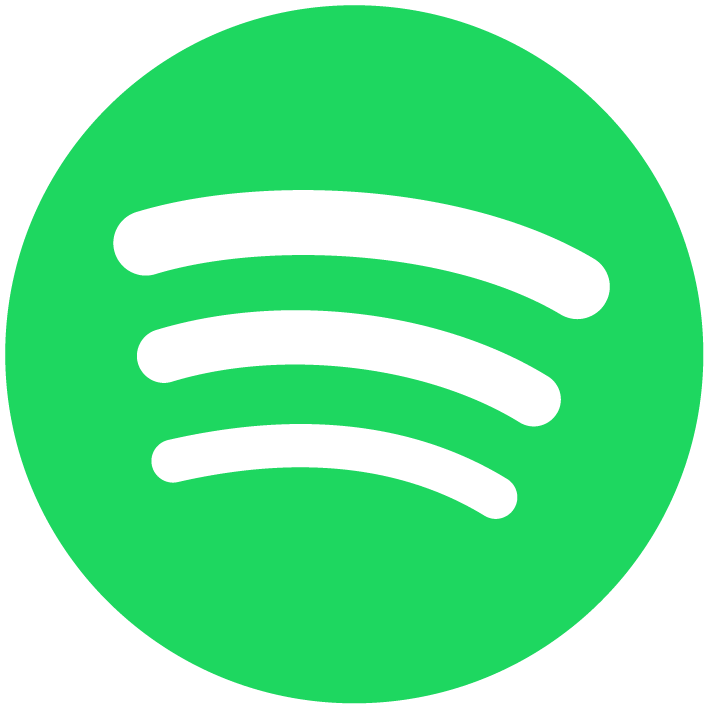 The songs are melodic, tell a story and are easy to dance to. Furthermore, many of the songs would be more than suitable for use in the classroom, or at children’s parties. 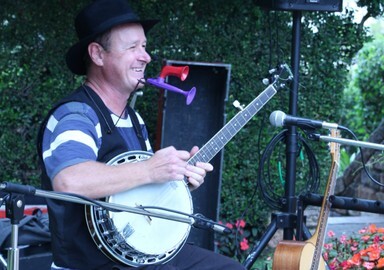 Brett Campbell is one of the musicians that will be taking part in the National Folk Festival in Canberra. 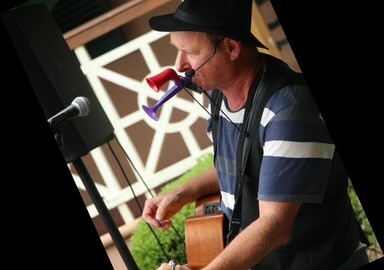 He has played music for 25 years and says the one thing he couldn’t work without is his kazoo. Check out his answers to our ArtsHub Career Profile below. Writer, historian, astronaut, cricketer, musician. A musician who writes a bit for fun, loves reading history, gazes at the night sky a bit and loves playing cricket when he gets the time. 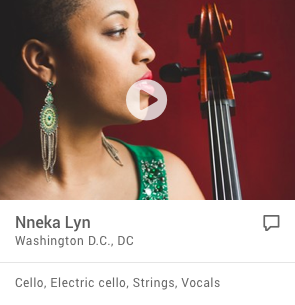 How would you describe your music to a complete stranger? What's your background - are there studies that prepare you for this? I meet musicians all the time [and always have done] who probably should be more well known than they are. It’s not always the best songwriter or most outstanding singer that wins fame and fortune. Recently in the US I met a Welsh folk musician named Martyn Joseph who, like me, has been playing for a long time with considerably more success than me. He reminded me that you don’t have to conquer the world to be happy and successful as an artist. Despite great talent, his humility and affable personality were always on show. I placed a video I took of him in Memphis on youtube and it got over 500 hits in 24 hours. I never knew he was well known in the UK. Can you describe an "average" working day for you? Answer emails. Change guitar strings. Get in the van and drive to my shows [anything up to 3 a day]. Come home and either help in the office or go into my music room for whatever is left of the day. Often a club or restaurant gig or a rehearsal at night but preferably not as I have 3 kids. What's the one thing - piece of equipment, toy, security-blanket – that you can't work without? Injustice, corruption and self centered people. This is an unpopular thing to say in some circles, but Paul McCartney is easily the most inspiring musician for me. Massive success from writing amazing songs has enabled him to completely ignore his critics and to their annoyance he is still one of the few acts on earth who can consistently fill stadiums. His songwriting, musicianship and performing are among the very best there’s ever been and he was the musical backbone of the Beatles in the second half of their career. Australia is a very difficult place to have success as a musician. 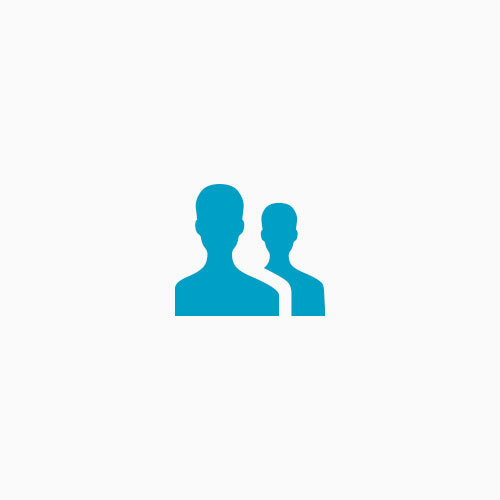 It is a very small and jealously protected market. The US, despite its reputation as a difficult place to make it in, is actually very receptive to up and coming musicians if you can find yourself in the right place. There is room there for everyone. Making kids laugh and have fun. I had to think about this one. It’s hard to complain about anything when you play music for a living. I do get annoyed when adults don’t respect what I’m doing. Especially at acoustic shows some people will talk loudly like I’m not in the room. Very distracting for me and not fair on the kids who are trying to have a good time. What advice would you give a young muso looking to break into the field? If you don’t have good management behind you from the start, develop a thick hide, get some accountancy skills, learn about car engines and don’t try and drag any boat anchors with you, no matter how much you love them – it won’t work! Learn how to handle rejection. It’s only someone’s opinion and remember the biggest band ever were rejected by EVERY record company except for a small unknown comedy label! Here is a selection of comments posted on the Rhymes facebook page after Brett's performances at Brisbane IGA Rhymes Kids Music Festival 23rd January 2011. Hayley Brimelow "My little guy is in awe of Brett Campbell...great to see such a friendly and talented guy promoting music and movement to the next generation!" Alicia Facoory "Brett Campbell on the secret garden stage was my favourite. Kids loved agelina ballerina and ben 10 :) can't wait for next year!" Donna Harrowell "As always Brett Campbell was great!! " He's got 3 children of his own and lives on a small holding in Queensland. The topics of his self-penned songs are topics that all kids can relate to..eg the excitement of the rubbish truck, animal songs and songs that help to make getting up and cleaning teeth fun!! He had the children in the palm of his hand through a strong connection with them right from the beginning. They participated enthusiastically (and so did some of the adults) by dancing, making noises, whistling and wriggling around on the floor! 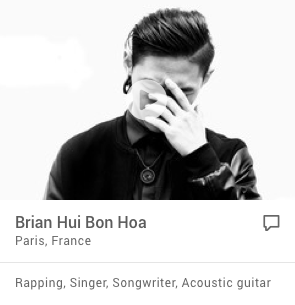 He is also a very accomplished instrumentalist. His session was fun with a capital 'F'! Recently Lifeline held the Doing Dad's Proud event at Cotton Tree park. 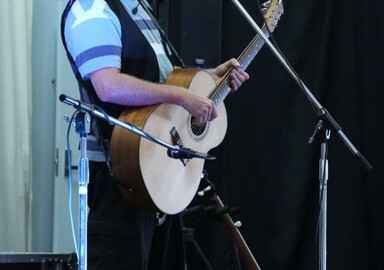 Brett Campbell was our main children's performer for the day. 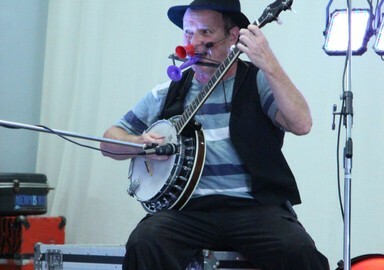 He was absolutely fantastic at entertaining the children and capturing their attention. 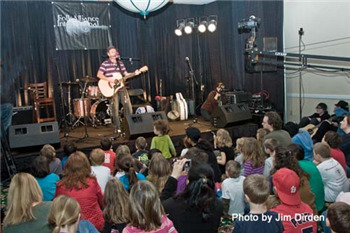 His songs are catchy and he related well to the kids who were attending the event. I would recommend him for any future shows. A very professional entertainer!! 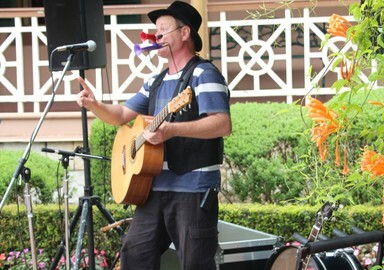 By far and away one of the most successful days at the Beach Hotel this year was the appearance recently of Brett Campbell and his band The Happy Fun Club. 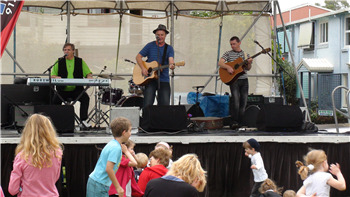 A fantastic family event, with kids and parents alike joining the musical journey. Any hotel planning family entertainment should definitely book The Happy Fun Club. "Scary Monster is the perfect song!" 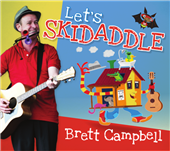 "Brett Campbell is fun and exciting with plenty of energy which you need when working and entertaining children. He makes the children smile and laugh and shows the children all the different types of musical instruments there are to play. His music/song lyrics are great for the age group. We wish him all the luck in the future and hope one day he can come back to our centre for another show." 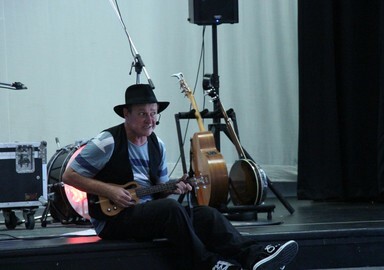 Maleny district singer-songwriter Brett Campbell was stunned last week when he received the news that his song about a 'scary monster' had made the semi finals in one of the UK's leading song writing competitions. 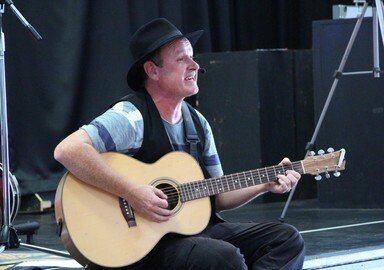 Brett, who lives with his partner and three children at Cambroon near Conondale, entered a children's song in the contest via the internet in May. "What makes it even more amazing to me is that of the 10 categories, there was none specifically for children's songs," Brett said. "So I had to enter this song called Scary Monster in the open section. To then be told i had reached the semi finals was just fantastic." The songwriting contest is as high profile as it can get, and it's patrons include Sir Paul McCartney and Simon Cowell no less. There were 6,200 entries from throughout the world. "Actually it's quite funny how the song came about," Brett said. "When my four year old pulled the plug out of the bath one day and the water made a funny noise going down the plug hole, he said, 'there's a scary monster down that hole'. The first time I heard him say that, I rushed out and got my guitar and started to write the song". 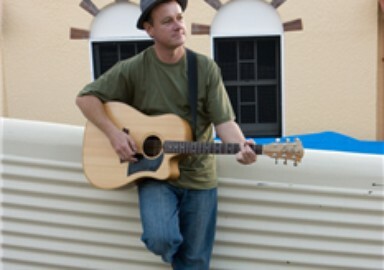 Brett has been a full time musician for 25 years, playing in the clubs and pub scene based in Brisbane. He moved to Cambroon 2 years ago to recuperate from a serious illness. On Saturday September 27, Brett will join former Savage Garden drummer-percussionist Glen Gibson to perform during Kenilworth Celebrates Festival. "We've got a portable music set up which we'll move from place to place around Kenilworth throughout the day and play a wide variety of music," Brett said. 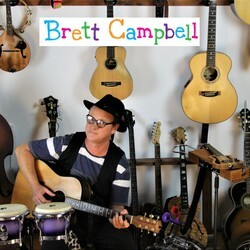 Brett Campbell is an Australian children's musician. of singing, dancing and games. 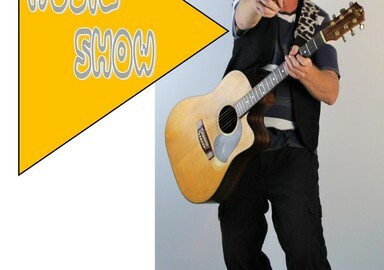 Children have the opportunity to get involved and see an experienced musician playing great fun, quirky songs. 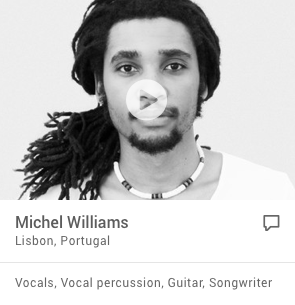 His 2019 performance features many instruments. Musical inter-action is at the forefront of the new show. 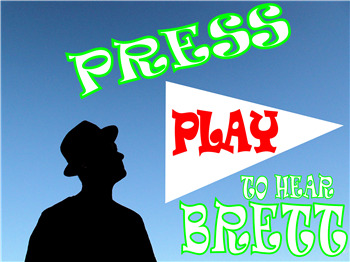 Brett plays more than 200 shows a year and has released 6 albums since 2006. 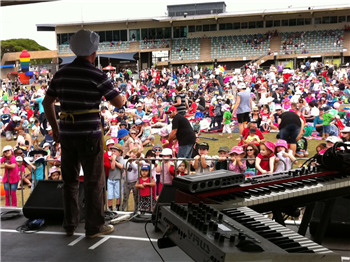 He has performed at many of Australasia's best festivals and has toured nationally with Hi-5, Peter Combe and Justine Clarke. Brett has visited the US and UK to play shows, including twice at the International Folk Alliance Conference in Memphis Tennessee where he was invited back after a successful showcase. 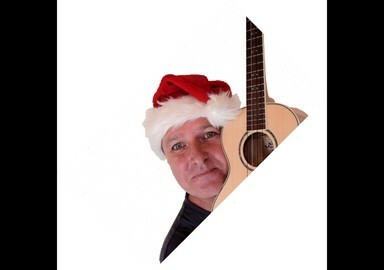 He is a 3 time semi-finalist in the UK Songwriting Competition. 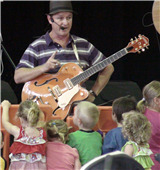 "Today we had Brett Campbell Children's Musician visit us at Kindy in Blue Group! 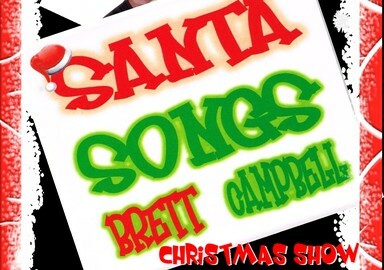 Brett plays a set of all original songs for children of between 30 and 45 minutes in length. but leave my light on just in case he's there! WOULD CHRISTMAS DAY STILL HAPPEN? DID CHRISTMAS DAY STILL HAPPEN? And the strange things you see when you turn off the light. kept Chloe awake when she wanted to sleep. If she went straight to sleep, and let good dreams appear! And promised herself she would not get a fright. And then she saw something on the end of the bed! And a horrible nose, with hair underneath. “Mummy!” she cried “come and turn on the light! When a crocodile jumped up and snapped at her nose! And his tail made him nearly as long as the wall! “Mummy!”, she cried “come and turn on the light! And she tried and she tried, but could not go to sleep. Like flying platypuses with horns on their wings! And she got out of bed and she turned on the light. A big stripey moth on her yellow lampshade! And never again did she call out in fright. and I’ve drunk up all my drink. is it yucky or a treat? or caterpillars stuffed with spam? or eggplant topped with pickled snail? Is it dandruff mixed with honey? or meatloaf filled with angry bees? How deep a ditch did the dirty dog dig? Did he dig 'til the deep ditch was dug? to a dog ditty like a doodlebug?